This material has been synthesized from information supplied by the Environmental Protection Agency (EPA), the Surgeon General, the American Lung Association, the Vermont Department of Health, and the New Hampshire Department of Health and Human Services. The EPA, the Surgeon General, and the American Lung Association recommend that all homes below the 3rd level be tested for radon gas since long-term exposure to radon gas is the second leading cause of lung cancer. The average outside radon in air level is 0.4 picocuries per liter (pCi/L) and the average indoor level is 1.3 pCi/L. In a Vermont residence there is a 1 in 8, chance that the radon in air level is at or above the EPA action level of 4.0 pCi/L. In New Hampshire there is a 30%, or approximately 1 in 3, chance of having an elevated level in the home. The average mitigation cost to reduce radon in air levels is between $800 - $2,500. Radon in air levels constantly fluctuate. It is prudent to follow-up a screening test with a year-long alpha track test (the most accurate radon test to obtain a yearly average). Radon in water contributes to the radon in air level. For every 10,000 pCi/L of radon in the water supply, the radon in air concentration is increased by 1 pCi/L. Long-term ingestion of elevated levels of radon in water can cause cancer in the stomach and other internal organs. The EPA proposed action level for private water supplies is 4,000 pCi/L (which the Vermont Department of Health defers to). The New Hampshire Department of Health and Human Services has established 10,000 pCi/L as the action level for private water supplies. Mitigation costs to reduce radon in water can run in excess of $5,000. The Coliform Bacteria Test is used to test the integrity of the well and the possible presence of disease causing organisms. The presence of coliform bacteria could indicate the infiltration of ground water and, thus, disease causing organisms. If present, the water is considered unsafe to drink until corrective measures are taken. The Combined Inorganic Chemicals Test includes primary (health related) and secondary (aesthetic) standards. Secondary standards are used for determining if a water treatment system is needed or is functioning. 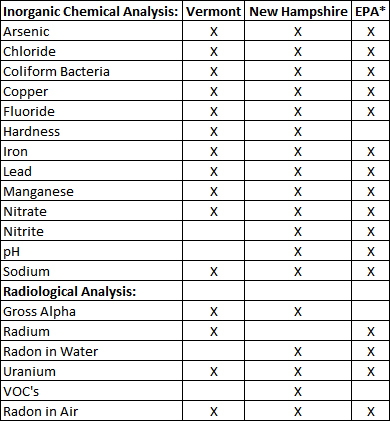 The Combined Inorganic Chemicals Test includes 4 primary standards: lead, arsenic, and nitrates and nitrites. Lead and arsenic can occur naturally. Arsenic was used in embalming and as a pesticide in apple orchards. High nitrate or nitrite levels can indicate pesticides or a failed septic system. 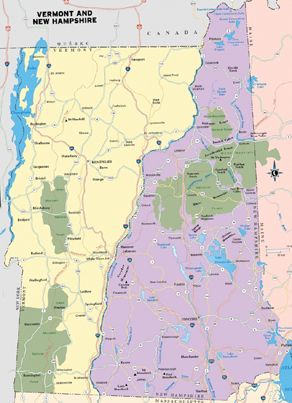 The Vermont Department of Health, the New Hampshire Department of Health and Human Services, and the EPA recommend conducting a Gross Alpha Test on private wells. Gross Alpha is an initial screening test for radioactive particles, which can occur naturally, such as radium and uranium minus radon. Long term exposure to radium can increase one’s risk of bone cancer and long term exposure to uranium can increase ones risk of kidney damage. If the Gross Alpha test result is 5.0 pCi/L or higher further testing is recommended to identify the specific elements. Important Consideration: In addition to health risks, there is a possible financial liability at the time of resale if elevated levels have not been detected and lowered.